You may notice that the first floor of your home has un-even floors that appear to be sagging. If so, there is every reason to believe your home is experiencing an excessive moisture problem in the area below your home. 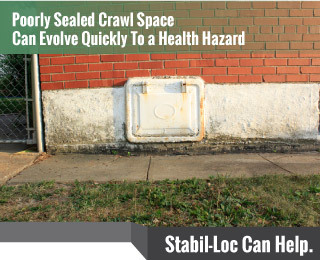 If the crawl space beneath the your building hasn’t been sealed off or waterproofed, then water seepage will easily get inside your foundation and be the cause a number of problems. Water collecting below your house may result in wooden structural elements suffering from rot, decay, and warping. This type of damage will make the floor boards and joists, joists and beams supporting your home to become weak. Ultimately, they will have trouble supporting the vast weight of the structure of your home above, which can cause sagging, uneven floors. Unfortunately there are two problems to fix. First, we will install jacks and supports to stabilize the floor boards, level your floors, and prevent additional sinking. Secondly, we need to account for damaging water and how it is gaining entry into your home. We will likely install a drain along the outside of your foundation which will divert moisture away from your home’s foundation and into a sump pump or drain pipe leading away from your home.